The “Blog” of “Unnecessary” Quotation Marks: or "bark"
I dont know what this bird is really going to do to you, but I'd stay away. Thanks, Leah. Why? The sign specifically tells you to touch them! Yes, Roland. They're lovebirds. They don't bite... hard. 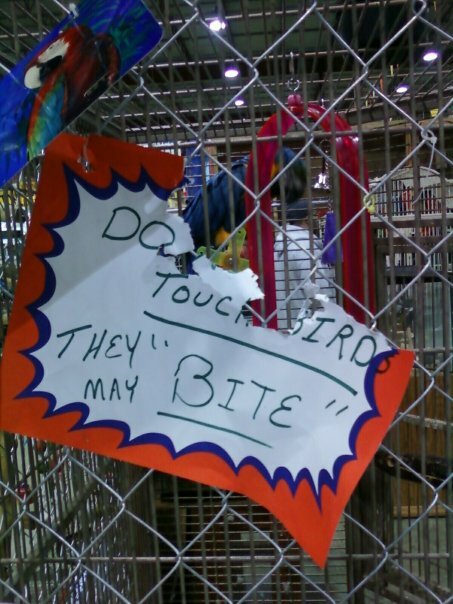 These Macaws actually amputate fingers, but we don't want to scare the customers that badly, so we'll just say "bite". WV: ingeri - you might get a serious one here if you're not careful.